B.M.S. 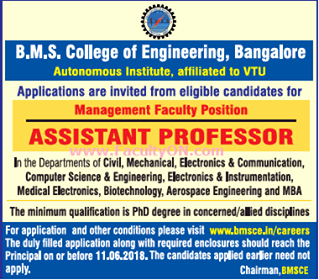 College of Engineering, Bangalore has advertised in THE TIMES OF INDIA newspaper for the recruitment of Assistant Professor jobs vacancies. Interested and eligible job aspirants are requested to apply with in 11th June 2018. Check out further more details below. About College: BMS College of Engineering (BMSCE) was Founded in the year 1946 by Late Sri. B. M. Sreenivasaiah a great visionary and philanthropist and nurtured by his illustrious son Late Sri. B. S. Narayan. BMSCE is the first private sector initiative in engineering education in India. BMSCE has completed 69 years of dedicated service in the field of Engineering Education. Started with only 03 undergraduate courses, BMSCE today offers 13 Undergraduate & 16 Postgraduate courses both in conventional and emerging areas. 15 of its Departments are recognized as Research Centers offering PhD/M.Sc (Engineering by Research) degrees in Science, Engineering, Architecture and Management. The College has been effectively practicing outcome based education.